There is a saying about being retired “you wake up with nothing to do and go to sleep with it only half done”. That must be what has been happening to us; almost two weeks without a blog posting!!! As we had planned, we met up with MOC friends for boondocking (no hookups) back on the desert near the town of Quartzsite just a couple of miles from where we had been parked when all of our excitement started. Carl & Susan, Ray & Pam had been to Texas and back since we saw them a month ago. 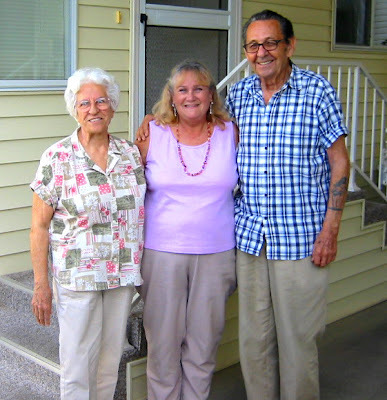 Dennis & Mary Kay had been to their stick home and were back on the road since we had last seen them. All six were planning to spend the weekend at Quartzsite and then return to their stick homes after the weekend. However, after they got phone calls from home about all of the rain and bad weather in California they decided to stay for the week. Since we had no plans we decided to stay as well. Quartzsite was way different than when we left it! Where there had been thousands of RVs there were now only hundreds, where there had been vendors’ stalls everywhere there were now only empty lots, and where there had been numerous Bead Stores there were only a handful still open. Once March 1st passed there were even fewer RVs on the desert. After a month at the KOA in Blythe next to I-10 it was very quiet on the desert. As at all RV gatherings we spent our time having: Happy Hour, eating and campfires. Either we went into town to eat (not many restaurants in Quartzsite) or having impromptu potlucks. The weather in Quartzsite was wonderful both day and night the entire week we were there. We had one day that topped out at 88 degrees! When not spending our time with Happy Hour, eating and campfires. 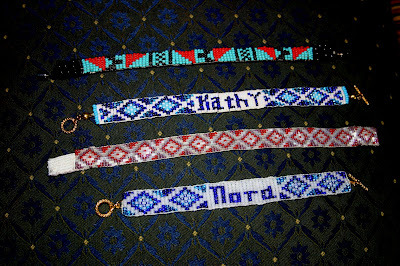 Kathy and the Ladies did a lot of beading and bead buying. Raider and I did a desert walk every morning sometimes with the other RV dogs from our group and sometimes by ourselves. In the afternoon Raider napped and I read or napped. Kathy, Raider and I did break away from this hectic schedule to take a 270 mile day trip to Surprise, Arizona to do a little shopping and to see Kathy’s neighbors from when she lived on Long Island as a child. Mary and Buddy were pioneer RVers in their day, 20 years ago. Not too many people thought of selling their homes and living in a travel trailer back in the 1980’s! Now in their 80’s they no longer tow their RV. They have retired to a park that has RV’s, park models and mobile homes. They own an “Arizona Room”, with their faithful and in mint shape Prowler next to their patio for the Guest House. They also have another place for the summer in the White Mountains, near Flagstaff, Arizona where they have a fifth wheel in a similar park. Up there they are at 7,000 feet in elevation and the temperature is a lot cooler! They were a treat to see again, still spry and enjoying this carefree lifestyle! We will be returning to San Jose in April to get a second opinion on more surgery for Kathy and have started to drift west. We are currently in Twenty-nine Palms, California about 2 miles from the entrance to Joshua Tree National Park. We will be here for a week before we continue our travels. I've had "the travel bug" since I got home from Alaska...I'm ready to pack up the dogs, Hubby and RV, heading west-maybe by June!!!! I think that man looks like a brother to an actor that was on the "Waltons". Very nice guy.